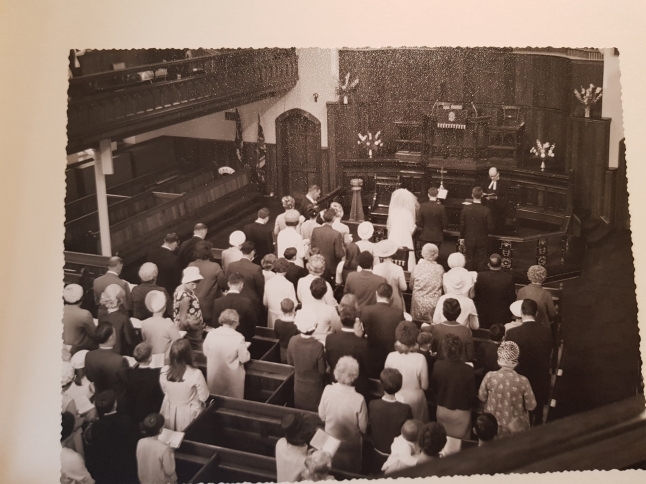 There have been Methodists in Gravesend since the early days of Methodism, indeed, as far back as 1771 a room was rented by the twenty or so members of the Society and John Wesley himself preached at the opening service to a crowded congregation. 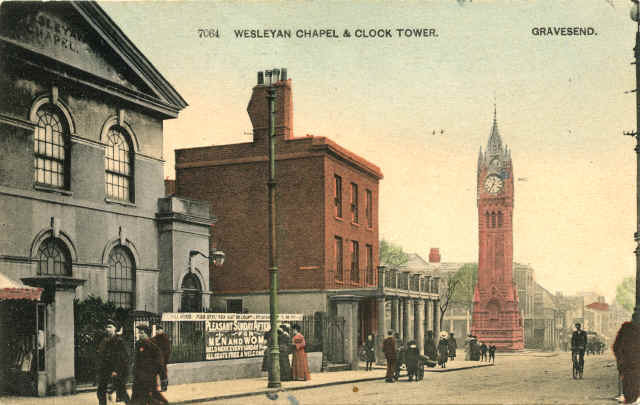 This first enthusiasm was short-lived however and, although one or two members still met as often as possible, it was considered by the authorities at Rochester, that “Gravesend was too wicked a town for much good to be done” and an application for a regular preacher was refused. In 1807 a further application was made, this time it was approved and regular services began to be held. These were so successful that the need was soon felt for a permanent building. Early in 1812 a meeting was held to consider the matter. From then on events moved swiftly; in spite of the uncertainties brought about by the Napoleonic War. 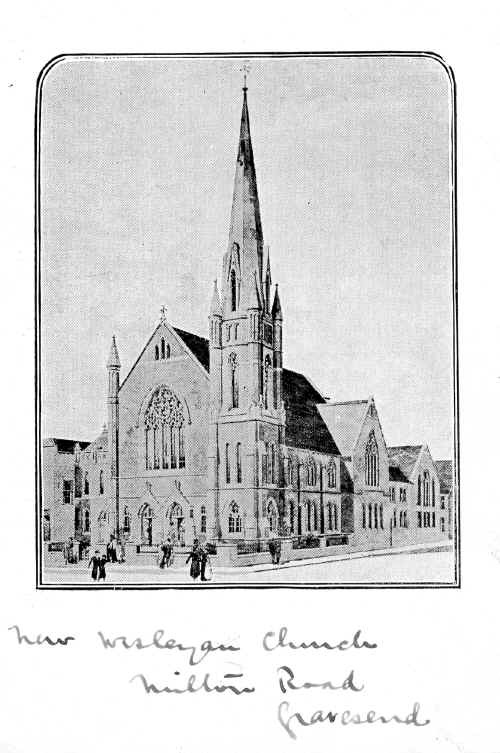 The new church was completed and the opening services held just six months after the decision to build had been taken. In the years that followed the church went from strength to strength. So much so, in fact, that by the end of the century the premises had become quite inadequate for its needs. 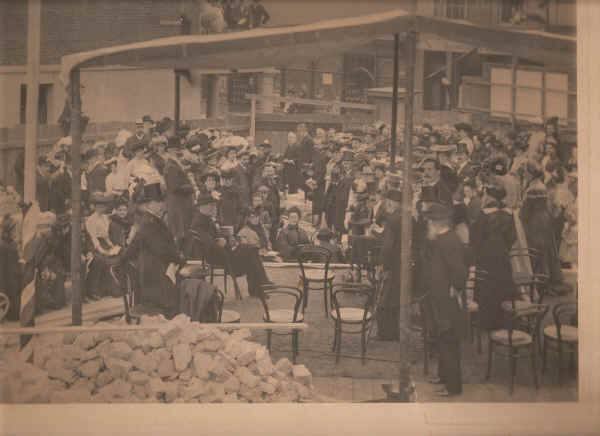 After much thought it was decided to rebuild the church and to include Sunday School Class Rooms and all other necessary accommodation on one site. 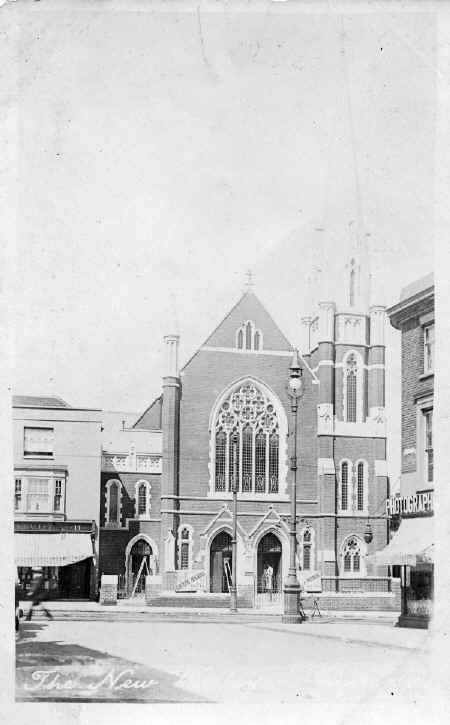 The cost of this was estimated to be £9000, but there was no hesitation, and by 1906 the Church and adjoining premises, as we know them today, had been built. 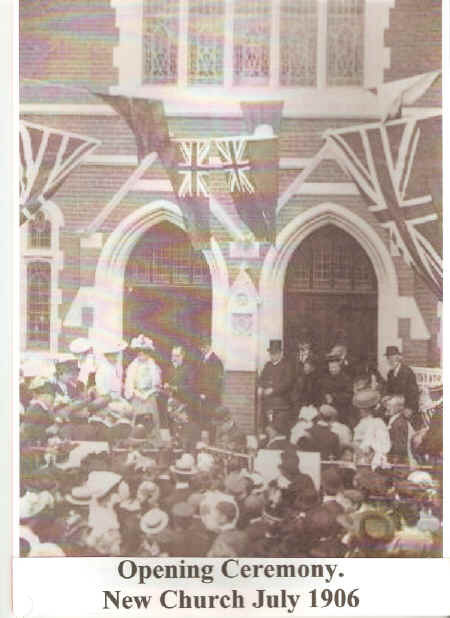 At the time of the opening some £5000 had already been collected - a wonderful effort in three years - but the debt was not finally extinguished until 1920. In 2006 we celebrated the centenary of our present building. Click here to see what we are up to in the 21st Century ! It was unanimously agreed to accept the tender of Mr Wm. 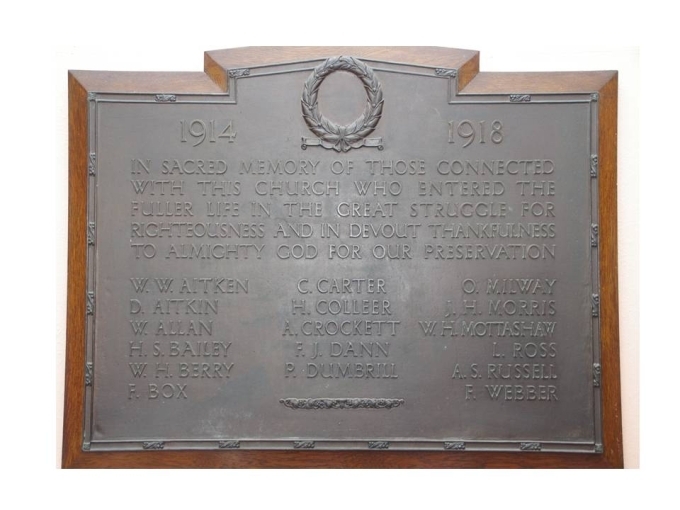 Ashenden for carpenters work, and that of Messrs Lot & Carley for bricklayers work. It was also agreed that the front of the Chapel should be set back 22 feet from the boundary of the site. Mr Morson, attorney was directed to prepare the contracts and also to get the Trust Deeds ready for signing. Mr John Nash was authorised to give Mr Curd of Gravesend , the sum of ten guineas for surveying the bricklayers work, and that Mr Flashman be asked for his account for drawing plans, the sum being afterwards stated as £14. At a meeting of the Trustees held on May 22nd, 1812, Mr Ashenden was requested to furnish an estimate for an oak fence for the front enclosure and it was also decided that the seats in front of the gallery be let at 4s. in the second row 3s, and the rest at 2s.6d. per quarter, and that those in the body of the Chapel be let at 2s.6d. and 2s. per quarter; and that the chandeliers of Rochester Old Chapel be purchased for use in the Gravesend Chapel. In April 1835 the Trustees agreed to the introduction of gas-light to supersede candles. Many interesting extracts might be made from these early minutes if space would permit. The appended obituary notice, however, shows the names of some of those on whom the burden of establishing our beloved Church in Gravesend chiefly rested:- Mr Robert Starbuck, died 1st February, 1831; Mr John Nash, Senior, died 23rd February 1833; Mr John Starbuck, died 27th August, 1834; Mr. Wm. Bouniwell, died August 1835; Mr George Osborn, Senior, died 5th May 1835; Mr John Bumstead, died 22nd January, 1837; Mr Robert Jessup, died 24th April, 1838; Mr. James Hulett LL.D. died 24th April, 1838. 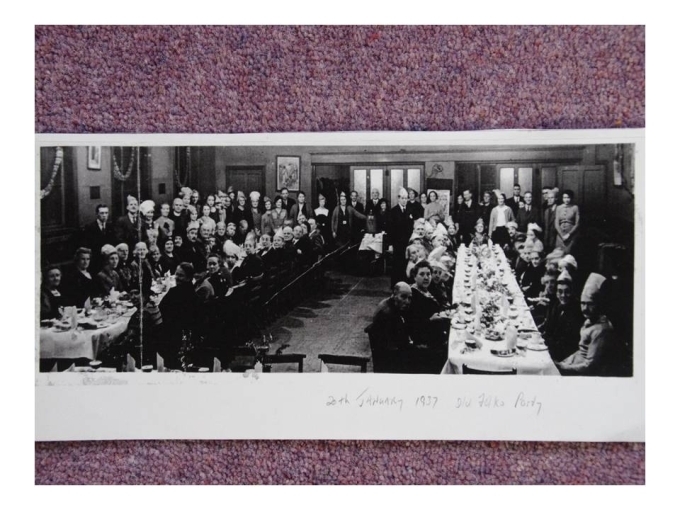 A present member of the Church, Mrs. Ford (to whom we are indebted for much information) dates her membership back to 1845, and she well recollects a former member rejoicing in the fact of his rowing John Wesley from Gravesend to Tilbury. 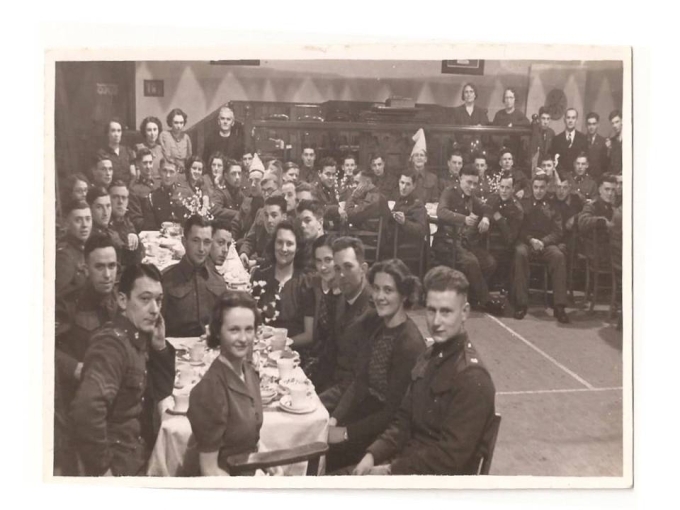 Mention might also be made of Dr. Armstrong, Mr John Emery, Mr J.R.May, Dr. Hawkins, Messrs. Hadler, Taylor , Knee, Emery, Moore , Shorter, C.Hooper Smith, Hammond , Broom, W.Carpenter, James Dean, John Rose and others, who helped to carry on the work so well begun, and who have gone to their reward. 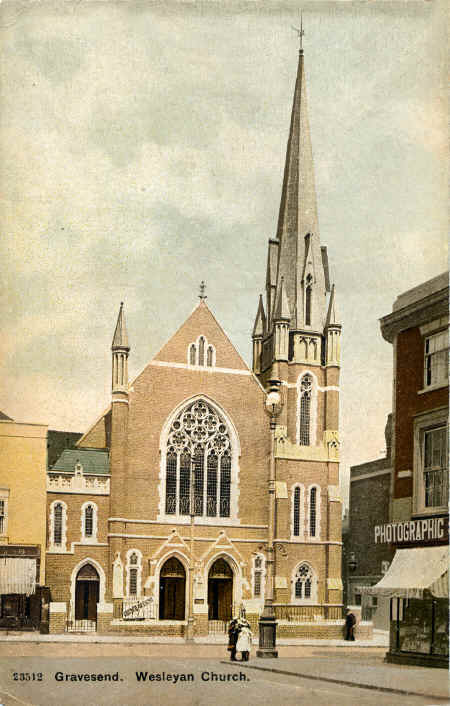 The Chapel has several times been altered and improved. 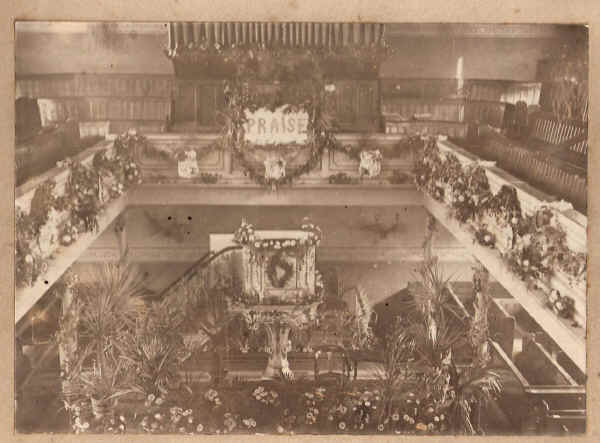 The pulpit formerly stood against the wall at the northern end of the Chapel, but it was brought forward to allow for the erection of the gallery for the organ. The instrument previously in use was located in the southern gallery. 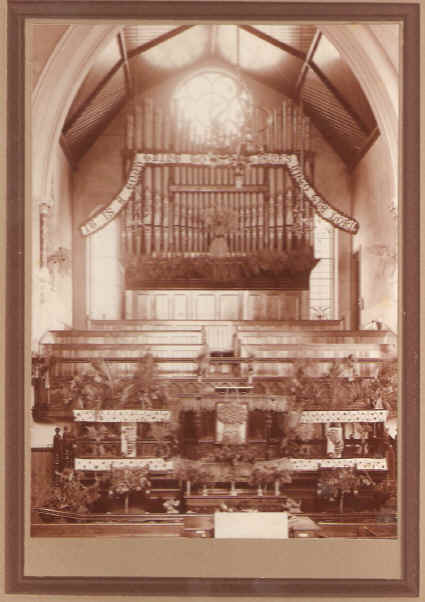 Referring to the organ it is fitting to remember Miss Broom, Mrs Nicholson and Mr. C.Hooper Smith, who in turn for many years led the psalmody of the services. The Gravesend Circuit was formed in 1819, the first superintendent appointed being the Rev. Thomas Rowland. At one time a large slice of Essex was included in this Circuit, but that arrangement ceased in 1895, when the Rev. G.H. Pickering then on the Gravesend plan, became superintendent of Grays. 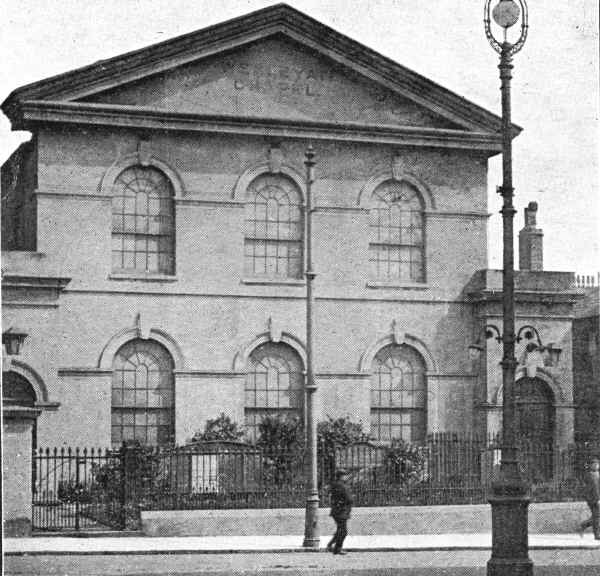 The record would be incomplete were it not stated that when the Chapel was first opened the Sunday School was conducted in a room in Manor Road , the superintendent being Mr. Richardson, a grocer of High Street. The School was subsequently removed to Peacock Street . It may well be expected that the knowledge of past achievements, so manifestly guided and controlled by the hand of God, will stimulate the Church of the present day to increased activity in order that our glorious heritage may be passed on for the spiritual good of those who are yet to follow in the train of our forefathers. 1771/72/73 Rev. John Wesley – Founder of Methodism. 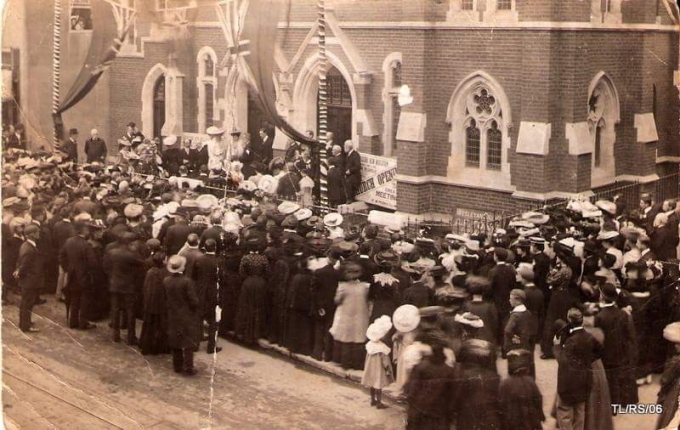 Opening of the Ebenezer Chapel, Milton Road , Gravesend . 1819 Gravesend Circuit formed, with a large part of Essex included. First Superintendent was to be Rev. Thomas Rowland. Found list of services:- Sunday 7 a.m. 10.30 a.m. 2 p.m. 5 p.m. & 6 p.m. Prayer Meeting Friday 7 p.m.
1841 Chapel enlarged to hold 700 persons. Sunday School, Manor Road . 1929-1931 Rev. G.H.McCormick M.A. B.D.